Born in a unit at Woolwich’s Royal Arsenal in 2013, Hop Stuff Brewery has since become one of the fastest growing craft breweries in London. Now with a team of 22 brewers and over 600 investors, Hop Stuff produce over 400 kegs of beer each week, available from the brewery’s own Taproom, as well as a number of bars and bottle shops. Aiming to ‘provide the perfect access point for those looking to explore the craft beer world’, the brewery has started to can their core range of beers, recently selling their first 12,000 cans through beer discovery box Beer 52. 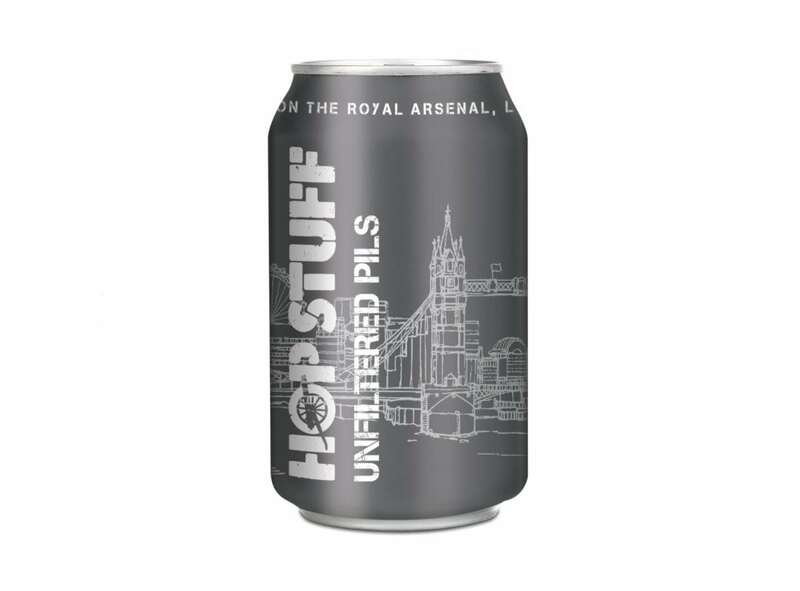 Brewed with Perle, Saaz and Mittelfruh hops, Hop Stuff’s Unfiltered Pils is the brewery’s tribute to Czech pilsner. When poured from the can, the golden liquid is hazy and crowned with a thin white head. On the nose, notes of lingering honey, light caramel and grassy hop back notes are joined by some very slight citrus aromas of lemon and grapefruit rind. Grassy hop flavours are again prevalent on the palate, combined with a relatively oily texture and medium bitter-sweet balance. Elsewhere, hints of apricot and pepper are also distinguishable, though the beer is intermittently watery. Complete with a dry, bittersweet finish – Unfiltered Pils is a fair British take on Czech pilsner, yet lacks crisp bitterness and purity of the classic style. Further information on Hop Stuff Brewery can be found here. All of the brewery’s core range cans are available to buy online from eebria.com.